Globally associated with glamour, celebrities, a vibrant nightlife and stunning beaches, the Cote d'Azur is a sun-drenched paradise which never ceases to captivate the touristic imagination. The Cote d'Azur is renowned as the playground of the rich, famous and beautiful and apart from the natural delights of its beaches and rolling hills it boasts splendid shopping, restaurants and nightlife as well as some wonderful art galleries and museums. The resort towns of Cannes and St Tropez are synonymous with the French high-life and never go out of fashion, and the city of Nice is charming and full of pretty parks and gardens as well as opportunities for historical sightseeing. Marseille, just beyond the French Riviera, is a vibrant port city rapidly transforming into a centre for culture and entertainment. In between, the Cote d'Azur has some picturesque medieval villages to investigate and a pleasantly sleepy countryside which often goes unexplored by the throngs who visit its beaches and resorts. The French Riviera has a Mediterranean climate with hot summers and mild winters. Summer is the peak tourist season in the Cote d'Azur and the beaches can get extremely crowded at this time. Traffic congestion can also be a hindrance to getting around in the busy summer months and during the famous festivals, like the Cannes Film Festival. In fact, many prefer to avoid the summer months, when the coastline can get a bit full, but those travelling to the Cote d'Azur to enjoy the stunning beaches will find that summer is the best time to visit. Read more on the Cote d'Azur's Climate and Weather. -Go celebrity-spotting in glamorous Cannes. -Visit the hillside village of Gassin for a taste of provincial Cote d'Azur. -While away the time in a seafront cafe in St Tropez. -Stroll along the shop-studded promenade of La Croisette. -Bask on one of the many famous beaches of the Cote d'Azur. -Shop for traditional crafts in the medieval village of Biot. -Take a boat trip to the islands of St Honorat and St Marguerite. -Hike up to the botanical gardens in the dramatically situated village of Eze. Nice Côte d'Azur Airport is situated four miles (6km) west of the city. Buses leave regularly from the airport for hundreds of destinations all along the Cote d'Azur. Flights to Nice Côte d'Azur Airport come from destinations all over Europe and it is a popular and pleasant airport. Get more information on Nice Côte d'Azur Airport. -The Cannes Film Festival was inaugurated in the 1930s in reaction to the interference of the fascist Italian and German governments in the selection of movies for the Venice film festival. -About three quarters of the world's essences for perfumes are produced from the gardens of the French Riviera. -In the peak summer months St Tropez welcomes up to 100,000 visitors a day. The French Riviera is renowned the world over for its glamorous nightlife, glorious beaches and gigantic gin-palaces. The chic resorts of Cannes and St Tropez have long attracted Europe's most affluent, from Russian Tsars to Hollywood stars. Along with neighbouring Monaco, the Côte d'Azur retains its reputation as the playground of the rich and remains one of the most desirable Mediterranean destinations. The beauty of the hills and the lively towns has inspired several great artists and the area has wonderful museums displaying their works. The quaint Provence hill villages abutting the coast, that once attracted Picasso and Matisse, now draw French and international tourists by the planeload. 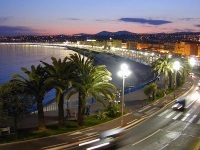 The centre of the Riviera is the pleasant city of Nice. Like all the resort towns that run into each other along this over-developed coastal strip it is packed with holidaymakers jamming its restaurants, bars and beaches during July and August. Visitors are drawn just as much by the wish to see and be seen in this desirable location as by the sultry sunshine, bright blue sea and luxurious facilities. However, there are a few villages and sights tucked away in less fashionable areas of the Côte d'Azur that are worth visiting for those looking for a quiet and authentic holiday.